Constructed of wood with textured vinyl covering. 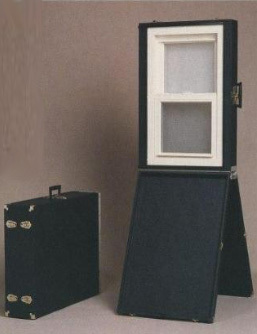 These cases allow for transport and are ideal for larger, heavier window samples. Custom designed steel hinges manufactured in our own facility enable the case to be opened, closed and easily transformed into a sturdy working display. Exterior and interior branding options are available to personalize your sample case. Holds 20″ x 30″ double hung window sample.